It’s been said that the mug makes the mule. If you’re mixing up Moscow mules, there’s nothing like promotional copper mugs to keep the drink ice cold – and your logo front and center. If you haven’t noticed, the Moscow mule is the cocktail du jour. It’s a snappy blend of vodka, ginger beer, and lime, and it’s always served in a copper mug. In fact, it’s that telltale mug that makes the drink so easy to spot. Dale DeGroff, a master mixologist and one of the most revered cocktail historians around, has said that the drink was first served in a copper mug engraved with two mules kicking up their heels. But why copper? The general consensus is that a copper mug keeps the cocktail much colder than a normal glass. If you’ve ever had a Moscow mule in anything other than a copper mug, you can likely confirm this. The story behind the Moscow mule is an interesting one. In the 1940s, two distributors – one selling ginger beer and the other selling Smirnoff vodka – found themselves in a pinch. No one was buying their products. At the time, people much preferred gin and whiskey. So the distributors, in what turned out to be a genius move, experimented with combining the vodka and ginger beer. They added some lime, and voila – the first Moscow mule was created. While this is the classic version, there are many ways to mix up a Moscow mule. Some people like to add crushed mint first; others like to top it off with freshly grated ginger. And still others like to add a few drops of Angostura bitters to give the cocktail some color and aroma while not altering the flavor. And then there’s the vodka. Smirnoff is the brand behind the drink, but Moscow mules can be enjoyed with any kind of vodka: Russian Standard, Grey Goose, Svedka, Square One, or Stoli are some great options to try. You can also swap out the ginger beer for ginger ale (just spice it up with a little cardamom), or even rum for a totally different twist on the cocktail – it’s called a Dark and Stormy. If you like your drinks sweet, this is the way to go. If you substitute the vodka for bourbon, it’s called a Kentucky mule. Opt for gin instead of vodka, and you have a Gin mule. It just depends what spirit you’re in the mood for. Back to the history behind the buzz. The tale goes that a third partner joined in. Needing to offload a surplus of copper mugs that wouldn’t sell, the trio brought their concoction and mugs to bartenders far and wide. The cocktail and mugs were a hit, and the rest is history. The Moscow mule is credited with reviving the vodka industry in the U.S., tripling the sales of vodka in the 1950s. Fast forward a few decades, and the simple, sweet cocktail has once again gone mainstream – and real connoisseurs know that it has to be served in a copper mug. A Collins glass (or any other glass) just won’t do. The mug, does, in fact, make the mule. The copper keeps it perfectly chilled, making it a must for this particular drink. As the drink continues to surge in popularity once again, copper mugs have become a hot commodity at bars and restaurants. People can’t get enough of the copper mugs, and they’re starting to swipe them from right under bartenders’ noses. Retailers can’t keep up with demand. At places like Crate & Barrel and Sur La Table, copper mugs are flying off shelves, and the stores have to scramble to keep them in stock. So, what does this mean for marketers? Now’s the time to customize copper mugs for your brand. Copper mugs aren’t just incredibly popular this summer – they’re also incredibly versatile. They make great take-home items to memorialize any event, whether you’re hosting an awards night or a company picnic. Every time recipients reach for the mug at home, they’ll be reminded of the fun times they enjoyed at your event. Are you getting the staff together for a big meeting this summer? What about treating team members to an incentive trip? Use copper mugs to celebrate the occasion. They’ll help employees bond (booze brings everyone together! ), and when staffers are back home, the mugs serve as a fun souvenir of the trip. If you own a restaurant or bar, copper mugs are a golden gift-with-purchase opportunity. Free stuff makes people want to buy. Offer customers a free Moscow mule when they buy the mug. You might be wondering how copper mugs can help you kick up your customer service, but they can. We recently came across a great customer service story on Hotwire. A reviewer mentioned that he tried to purchase copper mugs at the Four Seasons Las Vegas PRESS bar, and “all of a sudden,” they appeared in his room. Kudos to the Four Seasons for using these mugs to make the guest’s stay unforgettable. No matter how you use them, coveted, on-trend products are great ingredients for an effective promotion to build your brand. If you want more ideas on developing a promotion using copper Moscow mule mugs, one of our Brand Consultants would be happy to help. 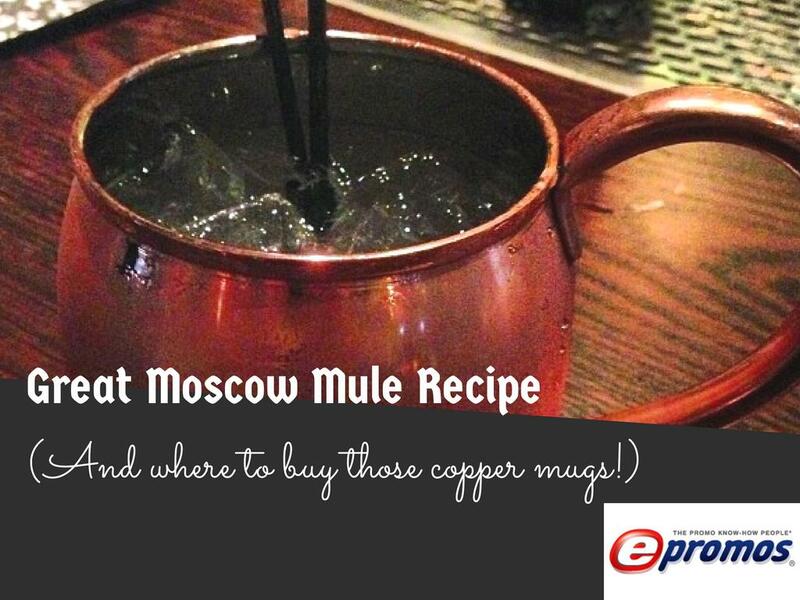 Click here for the best printed copper mug, and check out the recipe below to concoct your own Moscow mule. Fill your copper mug with crushed ice and pour the vodka over top. Give it a good squeeze of lime juice. Top with ginger beer and stir. Garnish with lime slice or fresh mint. Since this article was published in 2014, there has been a ton of buzz around Moscow mules. Do you think they’ve made even more of a comeback? Are you a fan? Let us know in the comments!